Negotiating The Retail Lease Termination Agreement, and the Lease Clause Critique: The Pro-Tenant Retail Lease Termination Agreement. 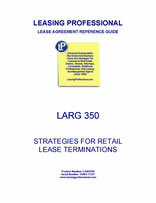 This LARG focuses upon the retail lease termination agreement. In addition to the following article analyzing the business factors of negotiating such termination agreement, the Lease Clause Critique covers an entire pro-tenant termination agreement with comment. Corporate retailers have a change of management or a change of heart, and this gives rise to a hard re-evaluation of existing locations. When weak locations get dragged into the spotlight, the decision is made to bite the bullet on them. One retail chain acquires another. Such acquisitions almost always produce redundant locations, and the combined company will assign or sublease leases for unwanted locations, if possible, i.e., if a replacement tenant can be found. If no one is interested in leasing the space, the tenant must negotiate termination agreements if it is not willing to operate two stores serving the same market. A retailer decides to abandon a region, and concentrate his efforts in markets producing strong results--when this happens, leases for stores in the region that gets the ax must be subleased or assigned, or terminated through negotiations with the landlord. Obviously, the tenant will try to assign or sublease the space if it is possible. The tenant is particularly motivated to do this when the rental under the lease is below market, and the tenant stands to make a profit by assignment or sublease. As a practical matter, transferring the lease to a third party is only possible when the location has real estate value from a retailer's standpoint. In many cases, the very reason the retailer wants to terminate the lease and discontinue operations in the location is due to real estate weakness. When a tenant is locked into a long term lease, possibly with operating covenants, negotiating an agreement to terminate the lease usually is an exercise in "checkbook diplomacy." This means that the landlord and tenant enter into negotiations to terminate the lease in consideration of a cash payment from the tenant to the landlord. Depending upon the amount of the termination payment, the approach can make genuine business sense for the tenant. The amount of the termination payment may be small compared to the annual operating losses the tenant sustains by continued operation. Further, if the tenant has resolved to close an entire geographical division (e.g., all of its stores in the southern California area), he simply cannot afford to operate one store in that geographical area. Economics of operation, distribution, and advertising dictate that all stores must be closed in the region.